As we prepare to enter the last trimester of 2012, the IRF Road Safety program is moving forward rapidly with a number of exciting initiatives, events and activities. All of these are helping IRF, and our members from all over the world, to fulfill our common commitment to the UN Decade of Action on Road Safety. We are all looking forward to our on-going successes at promoting Safer Roads & Mobility and reducing the dramatic road injury and death epidemic around the world. The new IRF Road Safety Group of Experts held its first working meeting in March in Amsterdam. This followed a series of three critical launch events at the end of last year. Over the summer, we launched the five core working groups under the Group of Experts. Each working group is led by a team of road safety experts drawn from the Group of Experts and responsible for a number of clear deliverables and substantive outcomes all designed to promote the Decade of Action. As we approach the final four months of the year, the Road Safety Program is also actively organizing and promoting a number of important regional and international road safety events: in October, a workshop on Road Safety in the SPECA Region in Astana, Kazakhstan; on 1 - 2 November, the 7th IRF Regional Conference in New Delhi a major international conference, just to mention two of them. Finally, at the end of November, IRF looks forward to contribute to the 16th meeting of the UN Road Safety Collaboration (UNRSC) of which IRF has been an active member since its inception. 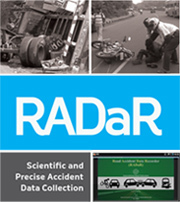 Finally, as 2012 slowly winds to a close, the Road Safety Program will be issuing several key technical and topical publications. The Guidelines for Road Safety Master Plans, set for release in October, will be an invaluable tool for governments working to integrate road safety master planning into their broader transportation planning. 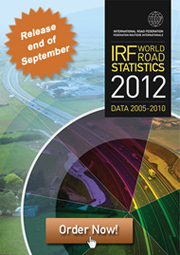 Additionally, in early December, the IRF Road Safety Bulletin will be published. The Bulletin will highlight important IRF member activities, projects, and programs which are making strong contributions to promoting the UN Decade of Action. For more information on these activities, events and initiatives, I invite you to read further. As always, your expertise only strengthens our work, our publications, and our events. I personally invite you to become actively involved in the IRF Road Safety Program, contribute to our growing pool of activities, and benefit from all that IRF membership has to offer. 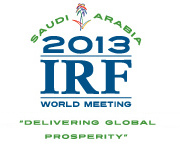 On 1 and 2 November 2012, the International Road Federation's India Chapter will organize the 7th IRF Regional Conference on Road Safety in Urban and Rural Roads. To be held in New Delhi, the conference aims to share knowledge, raise awareness, and propagate best practices in road safety. On 3 October 2012, the IRF and United Nations Economic Commission for Europe will jointly hold the "Workshop on Road Safety in the SPECA Region". The workshop, to be held in Astana, Kazakhstan, aims to promote the international agreements and best practices related to road safety and support the overall implementation of the UN's Decade of Action on Road Safety Action Plan in the SPECA region. Kazakhstan is recognized as a leader in the SPECA region in the field of transport and we are excited to have the opportunity to organize this important event there. Building on the three launch events held in late 2011, the IRF Road Safety Group of Experts held its first formal meeting in March in Amsterdam. On the agenda was a discussion of the Group's terms of reference as well as an examination of potential themes for the working groups established under the Group of Experts. Several notable presentations were made concerning the possible topics for the working groups. In all, over thirty members from twenty countries participated in the meeting. IRF to Publish "Guidelines for Road Safety Master Plans"
The first major publication of the Group of Experts is set for release in November. The "Guidelines for Road Safety Master Plans" is a technical resource and guidance document for governments working to implement road safety master plans. It draws on international experience in a number of places and will include case studies from several key international organizations and companies which illustrate the major arguments in the Guidelines. The second IRF Road Safety Bulletin is scheduled for release on December 3. Following up on the initial Road Safety Bulletin in early 2011, this edition is dedicated to four core themes: Engineering Measures for Infrastructure Safety - Road Safety Education & Training for Sector Professionals - Work Zone Safety - Intelligent Transport Systems and Road Safety Enforcement. We have updated and revamped the IRF Road Safety Program's website. The Road Safety Group of Experts and Working Groups are all meeting “virtually” on LinkedIn. And, of course, you may follow our progress and activities on Twitter.